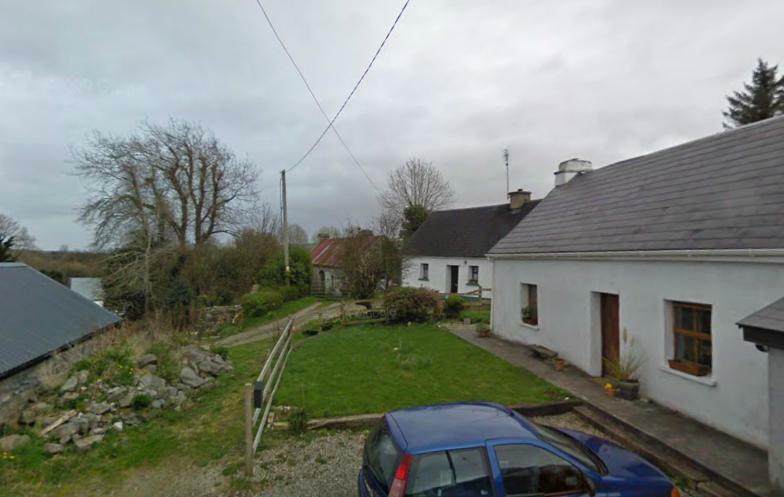 A clachan is a type of small nucleated settlement common in Ireland until the middle of the 20th century. They are usually defined as small villages lacking a church, post office, or other formal building. Their origin is unknown, but it is likely that they are of a very ancient root, most likely dating to medieval times. A true clachan would have been a cluster of small single-storey cottages of farmers and/or fishermen, invariably found on poorer land. They were related to the rundale system of farming. Rundale farming systems in Ireland existed from the Early Medieval Period right up until the time of the first World War. 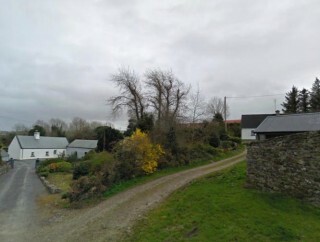 The main clachan area where the cottages and various out-buildings were concentrated was situated in a cluster on the best land (called the infields) which was surrounded by mountain or grazing land of inferior quality (called the outfields) where the livestock was grazed during summer or dry periods, a practice known as transhumance or as “booleying”. All the sheep or cattle of the village were grazed together to alleviate pressure on growing crops and also provided fresh pasture for livestock. In the remote western areas of Ireland where the rundale system was most commonly seen, the land was a complex mixture of arable, rough and bogland and it was a difficult task to ensure that each tenant had an equal share of good and poor land. According to David Lloyd, The Great Famine in Ireland (1845–49) caused such disruption to the social system that the clachans virtually disappeared. 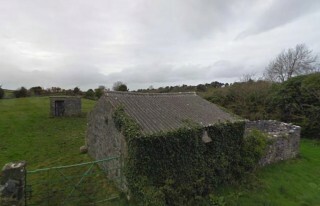 In some cases, they have evolved into holiday villages, or one or two houses have taken over, turning smaller houses into agricultural outhouses. The remains can be seen in many upland and coastal areas. Sometimes they are clustered in a dip in the landscape, to protect from winds, other times they stretch haphazardly along main roads. A good example of a clachan can be found in Magherabeg. 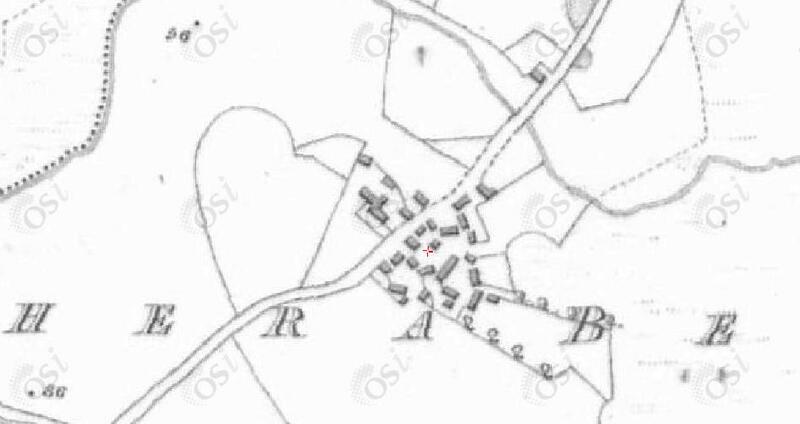 The above map from the mid 19th century shows a large cluster of buildings at the location demonstrating the clachan’s age. Today, although more modern houses have been built in the area many of the original structures remain. Three of the buildings are still used as residences while others are either in ruins or are being used as out-buildings. Interesting, these structures are located in a small valley on good land which is closely surrounded by mountain pasture and bogland. A nice feature of the area’s past day-to-day life still exists beside the river. 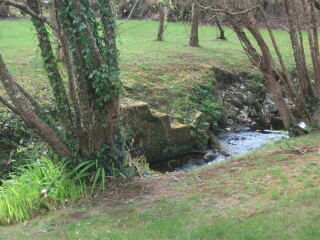 The attached photo shows three concrete steps leading down to the river. This would have been used by the locals to fetch water, wash clothes and other daily tasks. Its presence coincides perfectly with the fact that no well exists in the area. Unfortunately, these self contained, well-defined clachans/villages and the close-knit groups of people who occupy them are vanishing from the Irish countryside but hopefully their history as well as some form of their community cooperation will be remembered. What a magnificent discovery I have just made! A delight to be able to read the story of landscape. I will visit you again and again and remain delighted. Thankyou. Thanks Mary. Yes Lettercraff village would be another great example of a clachan. They were so widespread that they can be found in a lot of townlands throughout the country. If you were to scroll through the historical 6 inch OSI maps you’d see these clusters in Glengowla, Eighterard, Rusheeny, Clooshgereen, Magheramore, Gortrevagh, etc and many of the buildings connected with these are still present at the sites but are usually converted into sheds. I enjoyed this article. Would the village of Lettercraff be a ‘Clachan’? What other villages in the area would be considered clachans?